When I agree to shoot a wedding it’s obviously a commitment that I take very seriously. However, I was a little worried on Saturday I must admit. Kira and Trevor’s wedding was in the Quantocks and the weather was awful; snow, ice and fog; so after calling every car shop the day before only to hear they were sold out of snow chains, I decided to allow 3 hours for the supposedly 50 minute journey and had to replan routes several times to avoid ending up like one of the many ditched cars I saw on route. Anyway… a long ‘white knuckle’ story short… I made it in good time and a wonderful day was had by all. 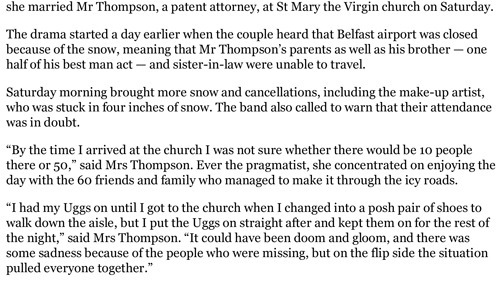 Sadly the Groom’s parents couldn’t make the journey from Northern Ireland but he remained cheerful in the face of adversity and spirits remained high a joyful. 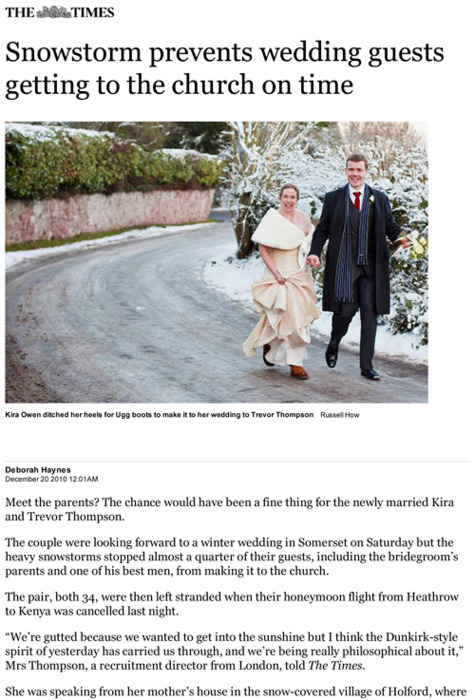 One of the guests was a reporter for the The Times newspaper and she wrote an artical about the wedding, which features one of my photos in today’s copy.